Prior to having children, I didn't truly understand why going out to dinner could be considered an occasion all in itself. You're just going to a restaurant, picking what you wanted from a menu, and eating it. What's the big deal? As a parent, it's a big deal. A night out to dinner is not only rare, but a fully-planned, highly anticipated event. What type of food? Are the kids ready? Will they be occupied? Is there something that everyone will enjoy? How far is the restaurant? Will there be a wait? On the plus side, not only does taking the family out to eat mean a night off from cooking, but it removes the stress of planning, shopping, preparing and cleaning that goes along with it. Instead, we show up, enjoy a (hopefully) delicious meal and get to spend time together talking, laughing and connecting. It's too bad that we can't combine the two, right? The ease of eating at home with the hassle-free experience of a restaurant? Now you can. 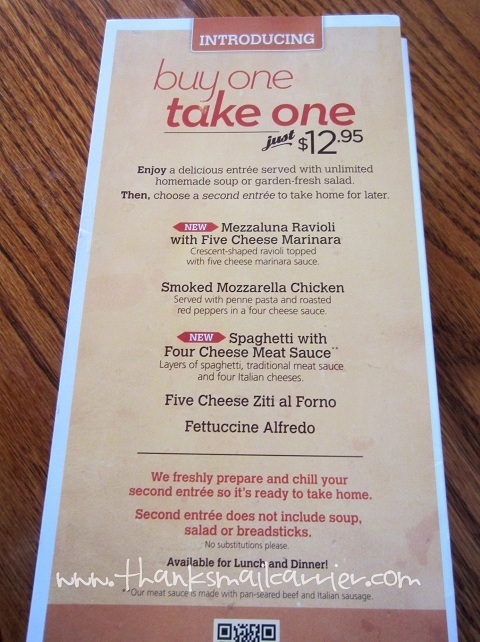 Thanks to the Buy One, Take One promotion at Olive Garden, you can now have the best of all worlds and extend it far beyond their walls. With their signature Italian dishes and affordable prices, Olive Garden both satisfies our comfort food cravings and ensures the ease and convenience of dine-in and take-out dinner options. Is there anyone that doesn't leave fulfilled and happy after eating Olive Garden's delicious entrees, handmade soups and garden-fresh salads? 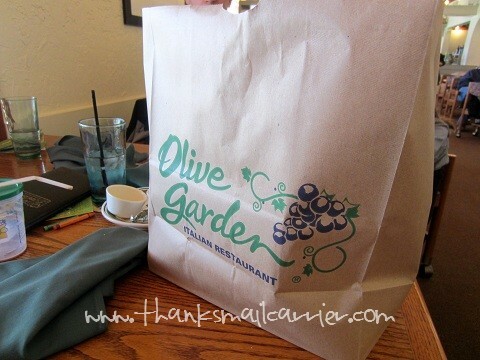 But as well as their traditionally tasty restaurant and menu, Olive Garden has made it even easier to enjoy their variety of foods with their Buy One, Take One promotion. Simply enjoy one of five delicious entrees — served with unlimited soup or salad and breadsticks, of course — and then choose a second entree from their special menu to take home for later. When you're ready for your next meal, just pull it out, heat it up and enjoy... and the total for both meals is only $12.95! 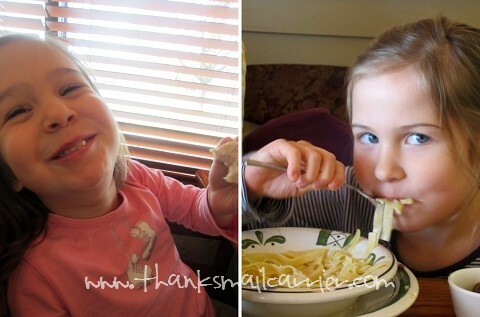 Olive Garden has long been one of our family's favorite dining spots, as everything from the delicious food (on the regular as well as kids' menu) to the friendly service has resulted in a casual, positive experience. But take an extra meal home so that we can extend our Olive Garden love into the next day? You don't have to ask us twice! While there have been times that we have had to wait to be seated, during our recent visit we walked right in and were shown immediately to our table. Now just to decide what to eat! While all of the regular menu and the five Buy One, Take One options sounded tasty, I couldn't pass up trying the new Mezzaluna Ravioli (cheese ravioli in a crescent moon shape) and the opportunity to take home a dish of the Fettucini Ravioli (a big favorite of mine and Big Sister E's). Instead of having to wait a great deal for our food to be cooked (and listening to the kids begin to complain about being hungry), in no time at all our salad and breadsticks arrived to satisfy everyone. Even better, our server offered to bring out the kids' meals as soon as they were ready, so it was only a few minutes later when those showed up as well! While there are times that I have ordered only the salad and bread due to how filling and tasty they are, I wasn't disappointed at all when our server arrived a short time later with my meal as well. Yum, yum and yum! You know it is the sign of a good meal when the talking ceases in favor of filling our mouths with more food instead! 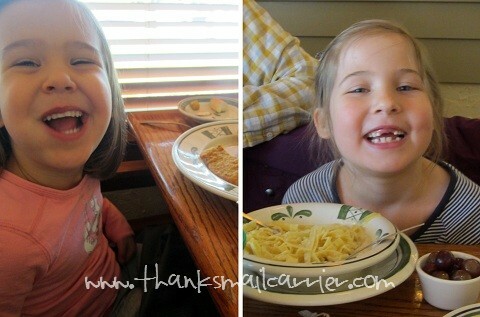 I'm sure I looked just as happy as the girls, as my Mezzaluna Ravioli was absolutely delicious! The cheese on the inside was just the right amount of richness and the sauce was the perfect complement — I would definitely order them again! When it came time to leave, a "regular" restaurant experience would have ended there... and, in this case, we would have been happy. However, with the Buy One, Take One promotion, I was not only able to leave with the leftovers of my tasty raviolis, but a full serving of Fettucini Alfredo for the following day! By the time dinnertime rolled around the following day, I could hardly wait to warm up my Fettucini Alfredo and dig right in! Olive Garden makes the whole process as foolproof as possible, as the meal comes chilled with its own directions on how to properly heat it. Really, can this get much easier? All it took was to place both containers in the microwave for a few minutes and dinner was done! I can't imagine a busy mom that wouldn't love being able to have a night out to eat and then having the following night's dinner taken care of as well! 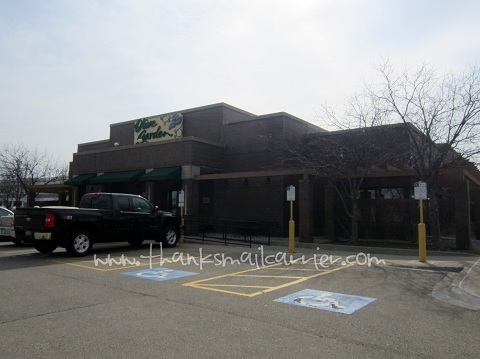 When it comes to knowing how to provide customers with the pleasure of enjoying a delicious, hassle free, casual night out to dinner, Olive Garden has long been a frontrunner in our list of favorite places to visit. But now with the Buy One, Take One promotion, being able to indulge in their tasty food two nights in a row for only $12.95 is a deal that can't be beat! If you're looking for a way to bring the whole family together (or have a relaxing date night, perhaps?) leave the distractions or stress of preparing a meal from scratch at home and head to Olive Garden instead. But, as this great money-saving promo is only on for a limited time, be sure to hurry over soon! 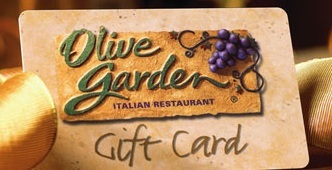 One lucky person will win a $75 Olive Garden eGift card! Mezzaluna Ravioli with Five Cheese Marinara sounds delicious! 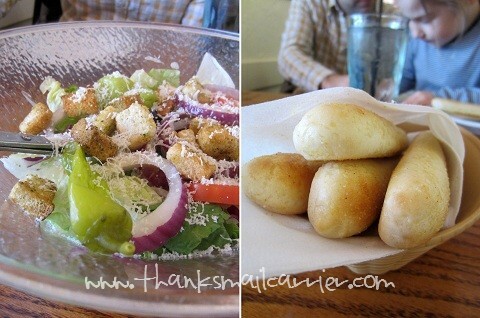 Olive Garden is my husband's favorite restaurant. Thanks for the giveaway! The Five Cheese Ziti al Forno! Yummy! Smoked Mozzarella Chicken sounds good! But they all sound yummy! All of them sound so good. I would definitely try them all eventually. I'm a big fan of Olive Garden. But first with the Smoke Mozzarella Chicken! I'd most like to try the Five Cheese Ziti al Forno. Smoked Mozzarella Chicken! Thanks so much for the fantastic giveaway! I'd probably go with the Mezzaluna Ravioli and the Four Cheese Ziti al Forno. I would like to try the Smoked Mozz. Chicken. I would love to try the smoked mozzarella chicken. Sounds delicious! I would most like the try the Smoked Mozzarella Chicken. I would like to get Olive Garden's Smoked Mozzarella Chicken Buy One, Take One entree. I think I would try the Smoked Mozzarella Chicken first. I'd love to try the Spagetti with Four cheese meat sauce. I would like to try the smoked mozeralla chicken. That is a tough choice, but I think my first pick would be the five cheese ziti al forno. I would go for the fettuccine alfredo. The smoked mozzarella chicken, followed by the 4 cheese spaghetti would be my choices. I would definitely want to try the Fettucine Alfredo. Yum! I would like to try the Mezzaluna Ravioli with Five Cheese Marinara. I would like to try the Five Cheese Ziti al Forno and the Mezzaluna Ravioli! I love their fettuccini alfredo - it is out of this world. Mezzaluna Ravioli looks so good. I'd like to try Mezzaluna Ravioli with Five Cheese Marinara. I would like to try the Spaghetti with Four Cheese Meat Sauce. Thanks. I would choose the Mezzaluna Ravioli with Five Cheese Marinara. 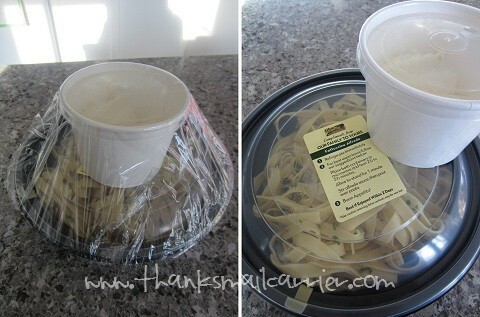 I love fettuccine alfredo and would love to try theirs. I would like to try ... Spaghetti with Four Cheeses. I would have spaghetti for dinner and take home the mozzarella chicken dish. I'd love to try the Smoked Mozzerella Chicken! I want to try the Mezzaluna Ravioli . I would most like to try the smoked mozzarella chicken. I would like the Five Cheese Ziti Al Forno. 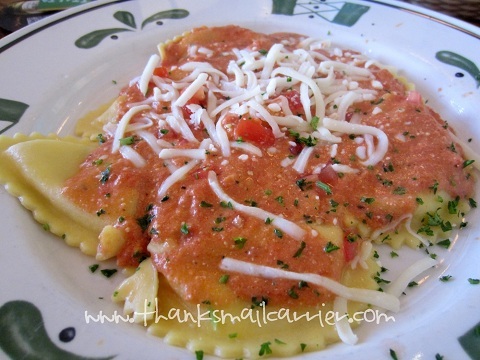 I would love to try the Mezzaluna Ravioli with Five Cheese Marinara and the Fettuccine Alfredo! the Mezzaluna Ravioli looks good! I would like to try the Mezzaluna Ravioli!!!! YUM!!! I want to try the Smoked Mozzarella Chicken! The smoked mozzarella chicken sounds good. The smoked mozzarella chicken sounds great! I want to try the Five Cheese Ziti! 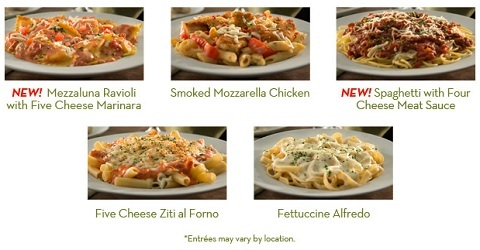 I want to try the Fettuccine Alfredo and the Smoked Mozzarella Chicken! Mmmm! i would love the alfredo! I would get the fettuccine alfredo. I'd like to try the Spaghetti with Four Cheese Meat Sauce. This post has made me so hungry. The Five Cheese Ziti for me! Delish! Would love to try the Smoked Mozzarella Chicken.. then the Spaghetti with Four Cheese Meat Sauce! I love the fettuccini Alfredo. smoked mozzarella chicken and mezzaluna rav. Smoked mozz. chicken now, fett. alfredo later! five cheese ziti alforno and smoke mozzarella chicken looks tasty. I want to try the "Five-Cheese Ziti Al Forno". I'd get two fettuccine alfredos! I would like to try the five cheese ziti and the fettuccini alfredo. spaghetti with 4 cheese meat sauce for sure! the five cheese ziti times 2!! I love all things Olive Garden, but most likely I would try Smoked Mozzerella Chicken. I would choose the Spaghetti with Four Cheese Meat Sauce. I would like to try the spaghetti with four cheese meat sauce. The smoked mozzarella chicken sounds tasty. Fettucini alfredo is always my favorite. The fettucine alfredo sounds amazing. I am a fettuccine alfredo fan so I'd pick that. Think my 1st choice would be the smoked mozz chicken. I'd love to try the Fettuccini Alfredo - yummy! I want to try their Spaghetti. They all look good, but the smoked mozzarella chicken sounds interesting. I would get the Mezzaluna Ravioli with Five Cheese Marinara!! Now I'm hungry!